An interesting feature of bowl compounds is their inversion. 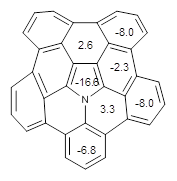 The inversion barrier, through the planar TS shown in Figure 2, is computed to be 17.0 kcal mol-1 at B3LYP/6-311+G(2d,p). This is 6-7 kcal mol-1 larger than the inversion barrier of corranulene, which is not surprising given the additional phenyl groups about the periphery. 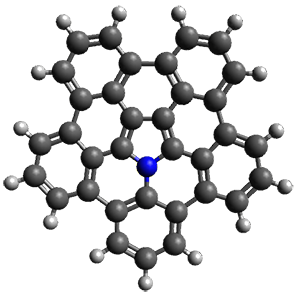 (1) Ito, S.; Tokimaru, Y.; Nozaki, K. "Benzene-Fused Azacorannulene Bearing an Internal Nitrogen Atom," Angew. Chem. Int. Ed. 2015, 54, 7256-7260, DOI: 10.1002/anie.201502599. 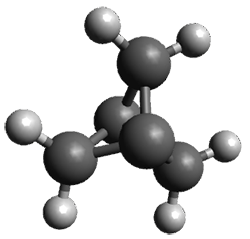 The computed barriers for either (1) loss of a methane molecule leaving behind the (CH3)2C+CH2CH3 cation or (2) loss of an ethane molecule leaving behind the t-butyl cation are small: 1.65 and 1.37 kcal mol-1, respectively. Kozuch employed canonical variational theory with and without small curvature tunneling (SCT). Without the tunneling correction, the pentamethylmethyl cation is predicted to have a long (millennia) lifetime at very low temperatures (<20 K). However, when tunneling is included, the half-life is reduced to 6 and 40 μs for degradation along the two pathways. 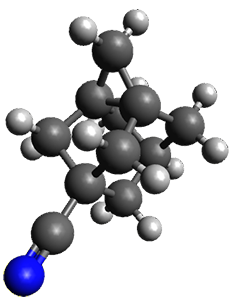 Clearly, this is not a fleeting molecule – its lifetime is really too short to consider it as anything. (2) Kozuch, S. "On the tunneling instability of a hypercoordinated carbocation," Phys. Chem. Chem. Phys. 2015, 17, 16688-16691, DOI: 10.1039/C5CP02080H. (1) Bremer, M.; Untenecker, H.; Gunchenko, P. A.; Fokin, A. A.; Schreiner, P. R. "Inverted Carbon Geometries: Challenges to Experiment and Theory," J. Org. Chem. 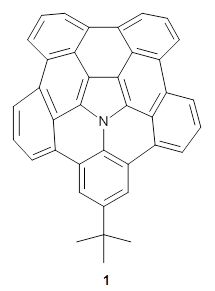 2015, 80, 6520–6524, DOI: 10.1021/acs.joc.5b00845. (3) Gibbons, C. S.; Trotter, J. 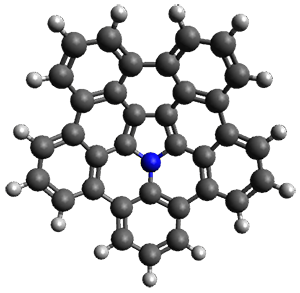 "Crystal Structure of 1-Cyanotetracyclo[3.3.1.13,7.03,7]decane," Can. J. Chem. 1973, 51, 87-91, DOI: 10.1139/v73-012.